I Love Lucy, the groundbreaking series starring Lucille Ball and Desi Arnaz, almost never got off the ground. CBS wanted to star Lucille Ball in a television series based on her successful CBS radio series, My Favorite Husband. But Lucille Ball desperately wanted to work with her then-husband Desi Arnaz, in hopes of rescuing their marriage. Despite CBS’ reluctance, she got her way, and Desi and Lucy started Desilu Studios for producing what came to be the most successful situation comedy of all time. Instead of the story of a successful Hollywood couple (the original idea), I Love Lucy became the story of a middle-class family trying to make ends meet, with Cuband bandleader Ricky Ricardo (Desi Arnaz) married to Lucy MacGillicuddy Ricardo (Lucille Ball), living in a New York tenament with their best friends and landlords, retired vaudeville performers Fred and Ethel Mertz (William Frawley and Vivian Vance). Lucy Ricardo’s striving to break into show business with one wild plot after another, as well as the genuine affection between Lucy and Ricky, was the foundation of the show. The inaugural season - setting the characters, developing the breakthrough system for filming a television series in front of a live audience. Married life for the Ricardos is interrupted by Lucy's on-screen pregnancy - a television first. Life for the Ricardos after the birth of Little Ricky, with some of the series' best episodes, including 'Million-Dollar Idea' (aka. Aunt Martha's Old Fashioned Salad Dressing' and a two-part visit by Tennessee Ernie Ford as Lucy's Cousin Ernie. A ground-breaking season, as the Ricardos and the Mertzes travel to California as Ricky stars in a movie -- a story arc that takes up the majority of the season. Ricky's band tours Europe, with Fred as the band manager -- and Lucy and Ethel come along as well, causing comedy across France, Italy, etc. The final regular season of I Love Lucy features a growing emphasis on Little Ricky, as well as the Ricardos move to the country. Tom Raymond, aka. 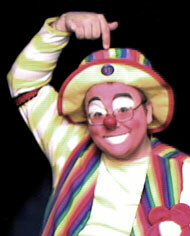 Raynbow the Clown, is a professional clown working out of Madison, Wisconsin, and is available for ministry events, conventions and conferences.